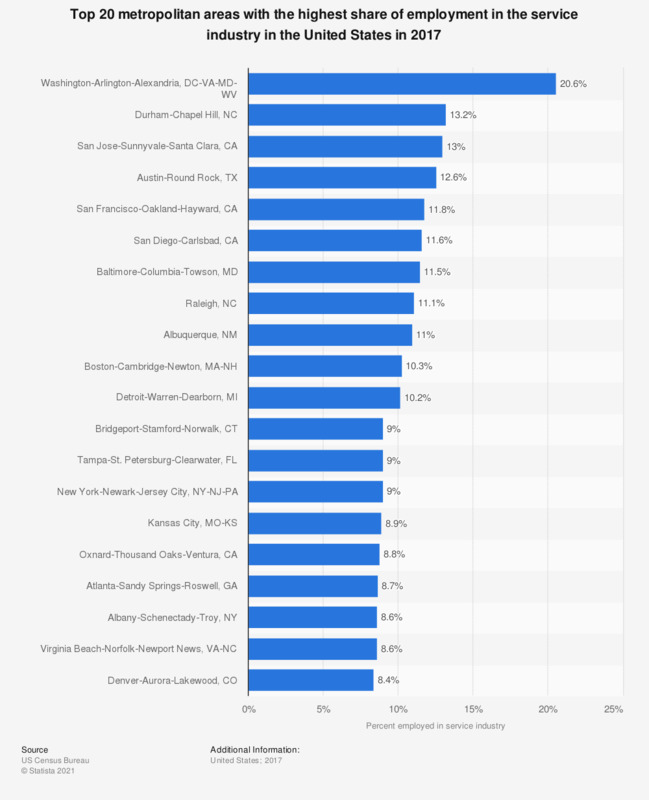 This statistic shows the top 20 metropolitan areas with the highest share of employment in the service industry in the United States in 2016. Percentage employed in service sector is shown as a percent of total nonfarm employment. In 2016, Washington-Arlington-Alexandria in Washington D.C. was ranked first with about 20.5 percent of total nonfarm employees was working in professional, scientific or technical services. Service industry includes only professional, scientific and technical services. * Data considered only for Metropolitan areas which reported a total nonfarm employees of 250,000 or above. According to census bureau, there were total 71 metropolitan areas in the U.S. with a population over 750,000 in 2015.